Are you adopting a microservices architecture, as a part of your application modernization effort or digital transformation journey? Do you understand the typical data problems you are likely to encounter, why are they different, and how can they be overcome? Microservices, containers, Kubernetes – they are no longer just buzzwords. Microservices has become a popular architectural style for building cloud-native applications that are self-contained, independently deployable, resilient and able to evolve quickly. Container technology is becoming the basic deployment unit for modern applications allowing software to be packaged into lightweight isolated bundles. And Kubernetes is evolving as the de-facto standard for container orchestration. These technologies and architectural patterns are designed to speed up development and deployment cycles and improve maintainability of applications. Despite all the advantages that these modern architectural patterns and technologies deliver, these advantages have a cost. Building microservices-based applications require rethinking of the data architecture and yet, there no clear guidelines on what data questions to ask when building cloud-native applications. A discussion about data often leads to more questions than answers. Fragmented data management environments lead to the adoption of many different databases. This increases the complexity of both operations and development teams. Sharing persistent data In a distributed modular architecture requires careful and complicated coordination between the teams developing these microservices. As an application developer, handling this complexity and ensuring data consistency is often left to you! The portability offered by containers enables effortless relocation or replication of a microservice across heterogeneous platforms but how do you effectively manage container sprawl? A microservices architecture implies a distributed system. But you need to accommodate and plan for possible performance and scale problems that could arise from issues such as network latency, fault tolerance, varying loads within application tiers and more. 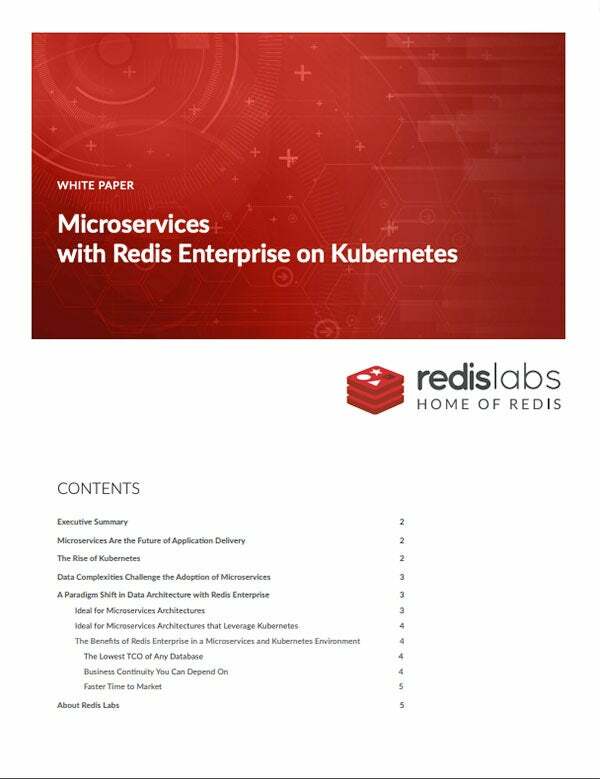 Redis Enterprise, a multi-model database, is purpose-built for microservices architectures that leverage the Kubernetes container orchestration tool. This quick read will discuss the top data challenges that inhibit the adoption of a microservices architecture and how Redis Enterprise not only helps overcome the inherent challenges of a highly distributed application environment, it also delivers the extreme flexibility and wide array of features needed to further power the limitless possibilities that microservices were designed to facilitate.